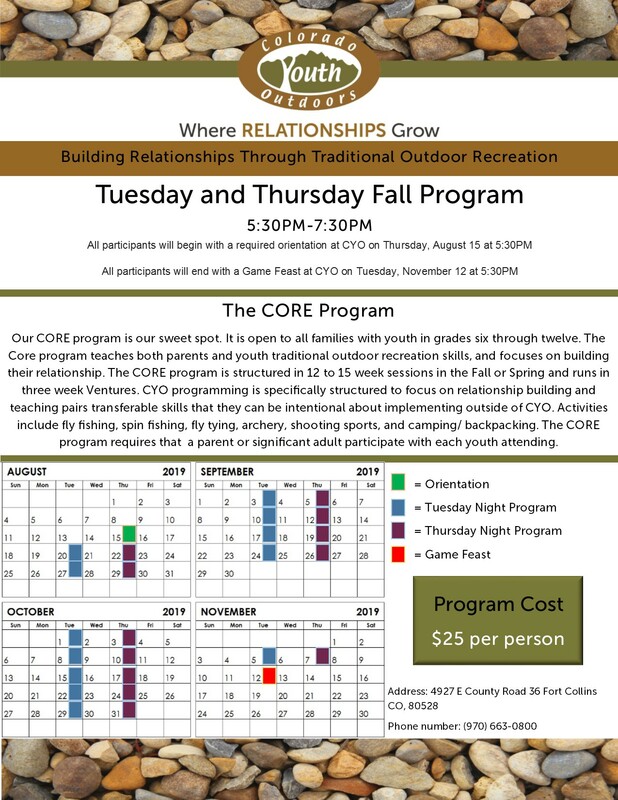 helping families with middle and high school students build and strengthen their relationships while learning lifelong recreation skills. Our programming is structured in 12 to 15-week sessions in the fall and spring and runs in three-week Ventures. A Venture focuses on one traditional outdoor recreation activity and is a minimum of two hours in length. 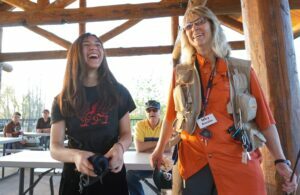 Activities include fly fishing, spin fishing, fly tying, archery, shooting sports, camping and survival, and orienteering. 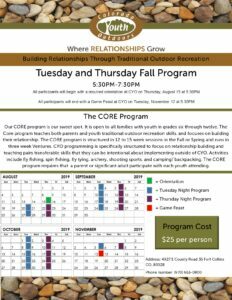 The programs are run in the evening, between 5:30 and 7:30, and require that a parent or significant adult participate with each youth attending. We also provide trained mentors to work with a parent who has multiple students attending or when a parent is unable to attend regularly. Please remember all students must be accompanied by an adult. We do have mentors available if needed. COLORADO YOUTH OUTDOORS WAIVER AND RELEASE AGREEMENT Please read carefully before signing This is a release of liability and waiver of certain legal rights I am also signing with the understanding that my signature testifies that I am not currently prohibited from receiving or handling firearms due to a felony indictment and or any other identified reason per ATF form 4473 In consideration for my being permitted to participate in the activities of Colorado Youth Outdoors, I agree to the following Waiver and Release: I acknowledge that hunting and/or target shooting has inherent risks, hazards, and dangers for anyone, that cannot be eliminated, particularly in a wilderness environment. I UNDERSTAND THAT THESE RISKS, HAZARDS, AND DANGERS INCLUDE WITHOUT LIMITATION: 1. The risk of activities around and near open water; 2. The risk of injury from traditional outdoor activities including archery, fishing, survival and shooting sports 3. The risk of injury from ammunition, clay targets and shot from other guns and handling of firearms including risk of ear / eye damage from noise or otherwise; 4. Walking in rugged country, including encounters with wildlife, animals and insects; 5. Inclement weather conditions. 6. The negligence of other participants and/or spectators over which Colorado Youth Outdoors has no control. I understand the risks, hazards, and dangers of the activities associated to Colorado Youth Outdoor programs and have had the opportunity to discuss them with Colorado Youth Outdoors. I understand that these activities may require good physical conditioning and a degree of skill and knowledge. I believe I have that good physical conditioning and the degree of skill and knowledge necessary for me to engage in these activities safely. I understand that I have responsibilities to avoid injury and liability to others and to myself. My participation in this activity is purely voluntary. No one is forcing me to participate and I elect to participate in spite of the risks. I AM VOLUNTARILY USING THE SERVICES OF COLORADO YOUTH OUTDOORS, WITH FULL KNOWLEDGE OF THE INHERENT RISKS, HAZARDS, AND DANGERS INVOLVED AND HEREBY ASSUME AND ACCEPT ANY AND ALL RISKS OF INJURY, PARALYSIS, OR DEATH. Lastly, I, for myself, my heirs, successors, executors, and subrogates, hereby KNOWINGLY AND INTENTIONALLY WAIVE AND RELEASE, INDEMNIFY AND HOLD HARMLESS, Colorado Youth Outdoors, their directors, officers, agents, employees, and volunteers from and against any and all claims, actions, causes of action, liabilities, suits, expenses (including reasonable attorneys' fees) which are related to, arise out of, or are in any way connected with my participation in this activity including, but not limited to, NEGLIGENCE of any kind or nature, whether foreseen or unforeseen, arising directly or indirectly out of any damage, loss, injury, paralysis, or death to me or my property as a result of my engaging in these activities or the use of these services, animals or equipment, whether such damage, loss, injury, paralysis, or death results from negligence of Colorado Youth Outdoors, or from some other cause. I, for myself, my heirs, my successors, executors, and subrogates, further agree not to sue Colorado Youth Outdoors as a result of any injury, paralysis, or death suffered in connection with my use and participation in the activities of Colorado Youth Outdoors. Model Actor Release I hereby authorize Colorado Youth Outdoors or any parties designated by them ( individual clients, broadcast media, periodicals or other print matter and their editors) to use my video or printed image and my name as well as my comments and opinions expressed for use in advertising, display, exhibition or editorial use. The parties to this contract expressly agree that the laws of the State of Colorado shall govern the validity, construction, interpretation and effect of this contract (or release). I hereby waive any right that I may have to inspect or approve the finished product or the advertising or other copy that may be used in connection therewith or the use to which it may be applied. I HAVE CAREFULLY READ, CLEARLY UNDERSTAND, AND VOLUNTARILY SIGN THIS WAIVER AND RELEASE AGREEMENT. MUST BE OVER THE AGE 18 TO SIGN. INDEMNIFICATION In consideration for the minor listed below being permitted by Colorado Youth Outdoors to participate in the activities of Colorado Youth Outdoors, including fishing, camping, hunting and/or target shooting, which include, without limitation, the use of its services, animals and equipment, I agree to the following waiver, release, and indemnification: The undersigned parent, guardian, or custodian of the below minor, for himself/herself and on behalf of said minor, hereby joins in the foregoing Waiver and Release and hereby stipulates and agrees to save and hold harmless, indemnify, and forever defend Colorado Youth Outdoors, their directors, officers, agents, employees, and volunteers from and against any claims, actions, demands, expenses, liabilities (including reasonable attorneys' fees), and NEGLIGENCE made or bought by said minor or by anyone on behalf of said minor, as a result of said minor's participation in the activities of Colorado Youth Outdoors and his or her use of the property, animals, if any, and facilities of Colorado Youth Outdoors. I, for myself and on behalf of said minor, further agree not to sue Colorado Youth Outdoors, as a result of any injury, paralysis or death that said minor suffers in connection with his/her participation in the activities of Colorado Youth Outdoors. By checking here I understand and agree with the terms of this waiver for all participants I have registered. There are many families who are unable to pay for our program, we use your scholarship funds to help them with the costs.